Places for ride road bike near Moscow. Route of 83 km. 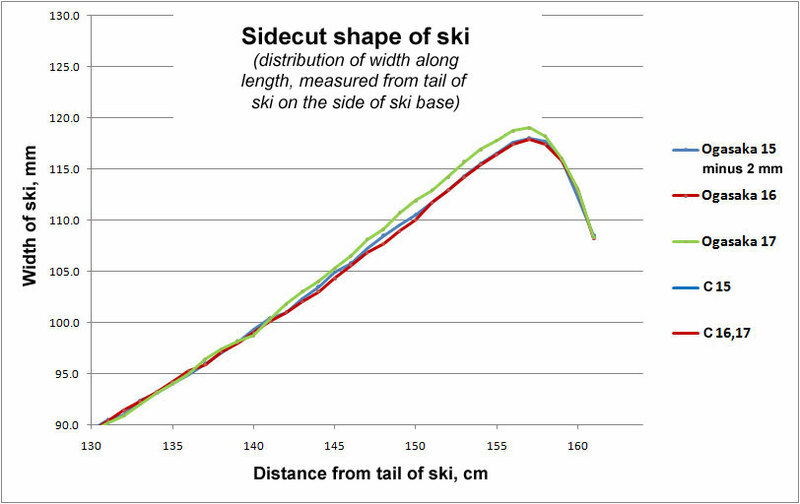 In this article I present the results of sidecut measurements of skis Ogasaka Triun SL model year 2015, 2016 and 2017. The distribution of width along the ski was measured fairly accurately, my estimation of the accuracy is 0.2 mm. On the base surface was put adhesive masking tape marked by every 1 cm. Width of skis was measured with Vernier Caliper. Then the same tape was put to the next ski. Since ski Ogasaka Triun SL of 15/16 season became less by 2 mm than the width of previous model, these two millimeters were deducted from measurements of ski of season 14/15. Therefore, comparison charts characterizes the shapes of the sidecut. On this scale there is little seen but it is possible to note a couple of moments. First, the shapes of the sidecut skis of 2015 and 2016 matches. This is contrary to what was written in the catalog. There is a shift of boot center line to 7 mm forward and the width of the ski 2016 is lessen to 2 mm. 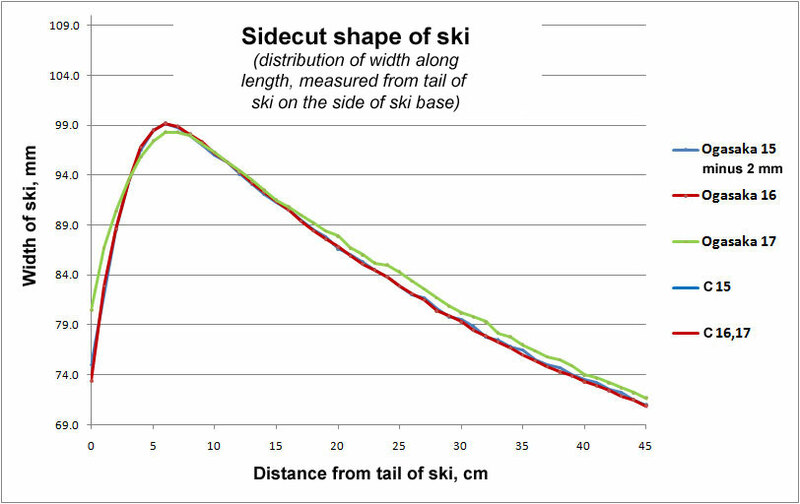 But the shape of the sidecut has remained exactly the same as in the chart blue line showing the shape of ski in 2015 can not be seen at all, it is completely covered with a red line with data of ski 2016. 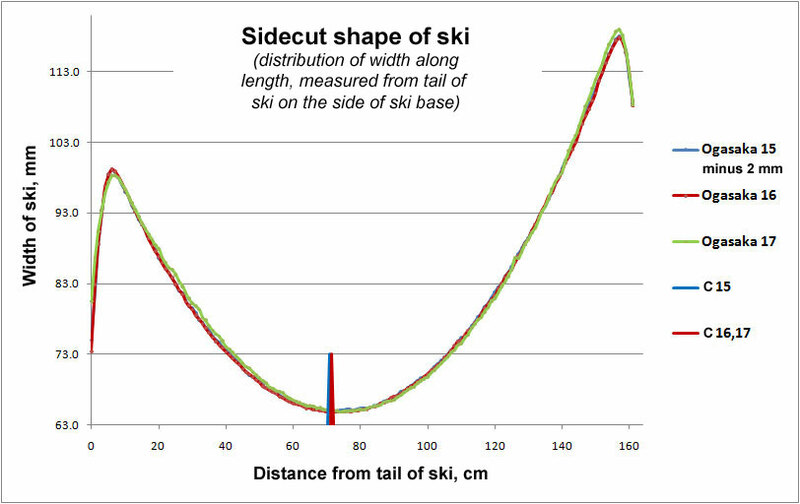 Reducing the width of ski to 2mm – looks like a significant step forward. Waist width of 65 mm (as it became in the model of 2016) is an indicator of all European brands for “race stock” models, while the “store” slalom skis is also 2 mm wider. Reducing the width allows faster change edge but it is important that this has not led to a decrease in the rigidity of the ski torsionally. If talk about me, it is unlikely that I will notice the difference in waist 65 or 67 mm when skiing, while the lack of torsional rigidity, I think it will be very noticeable. Therefore, I would be calmer, if ski of the same construction and materials would remained with 2 mm larger width. About ski Ogasaka Triun SL of 2017 model year, one can note the following. Position the boot center line and the width of the waist exactly like in model 2016. Tip (shovel) is wider, but from the point of 130 cm to the middle the ski versa slightly narrower. The tail of the ski is just the opposite, from the middle and to the point of 20 cm Ski 2017 is wider then becomes exactly the same, and at the very heel as though cut to 1 mm more. As the overall picture there is little to see, an enlarged portions. Lines connect simply measuring point without smoothing or splines. Therefore, the draw reflects the measurement accuracy, and may be precision of manufacturing too. It could be using splines with minimal deviations (ie, using the assumption that the shape of the curve should be smooth) to achieve greater accuracy, but it seemed to me, there is no need to do it here. The shovel section. On the interval 130-140 cm shapes of all three skis are the same, then tip of the ski 2017 gradually becomes wider, for example at around 153 cm difference is 1.5 mm. Skis of 2014 and 2015, as already mentioned, are the same. I shall not dwell on this further. 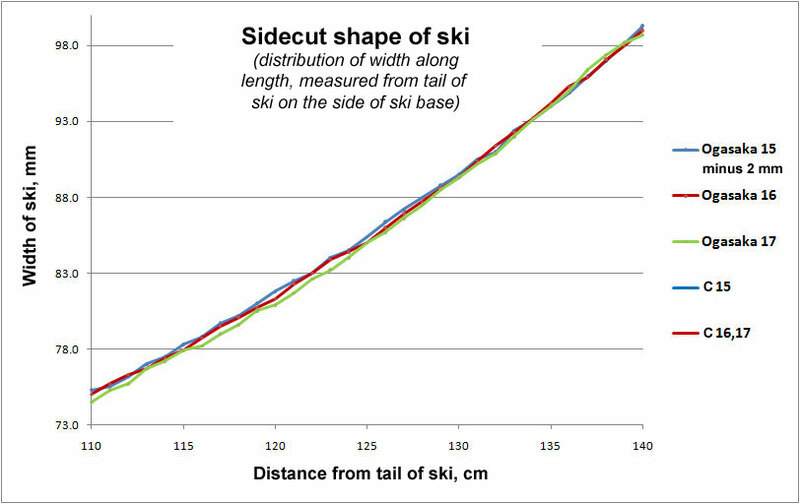 It may be noted that in the region 125-140 cm sidecut shape is the same, and in the area of ​​110-125 cm ski of 2017 becomes slightly narrower by about 0.5 mm. Not much, but enough to be noted that the shape of the curve is redesigned. 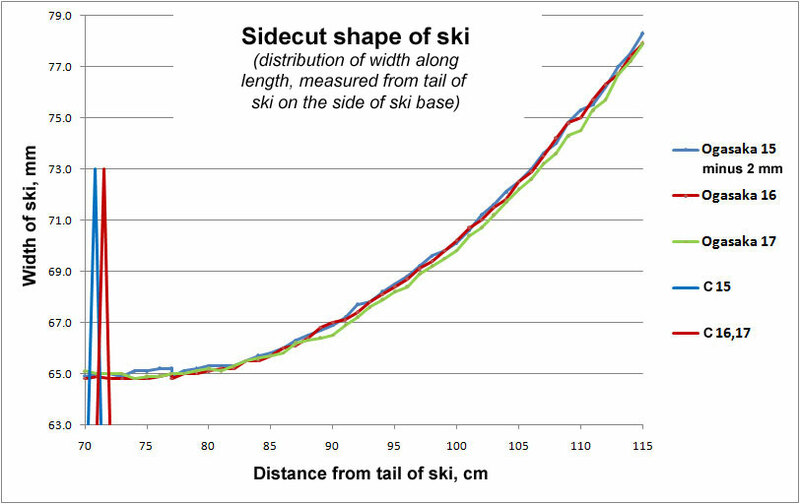 At the reagion 110-90 cm picture remains, ski of 2017 slightly more narrow, while in the central part of the ski all the curves coincide. Approximately 10 cm to the tail from the ski boot center line of 2017 becomes wider and then this feature is increasing. At around 45 cm difference is 0.7 mm. This excess width takes place to the point 15 cm from the tail and then to the final bending shapes of the cutout coincides, but final “tail shovel” itself is cut by 1 mm narrower. It seems that the designers considered that the old skis too clung by the very tail. 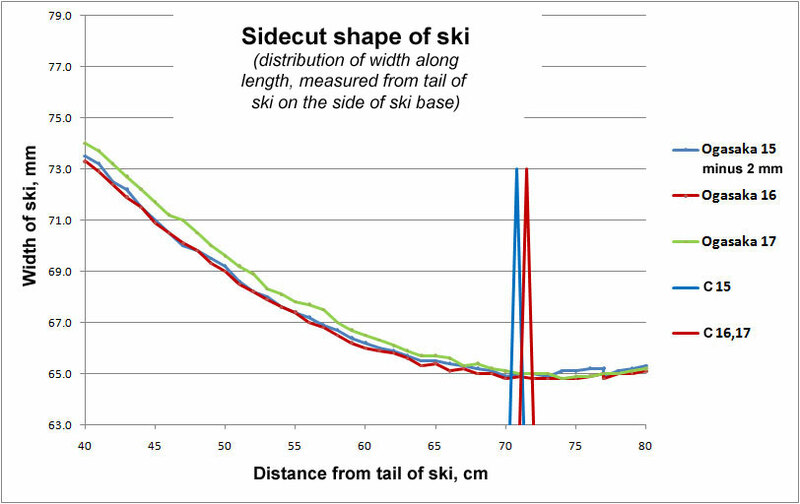 Thus, despite the fact that the “width of tail” from skis 2017 became less than 1 mm, the entire tail is actually wider until the last 7 cm, from which the “working” part is only 2 cm for ski 2017 and 3 cm for skis 2015, 2016. It is hardly possible to draw definitive conclusions only on the basis of sidecut shapes. We should also take into account the presence (or not) of the rocker and to compare the changes in the shape of deflection under load for these models. Nevertheless, based on the measured data something is more than noticeable. I shall mention again these observations. The sidecut shape of skis Ogasaka Triun SL model years 2015 and 2016 is the same. Boot Center in the model 2016 is moved forward of 7 mm relative to the model 2015. In fact, it is less than the moving shoes when fitting “to taste.” In sports bindings Atomic is a little less than a “one click”. The model 2017 boot center remained the same as that of the model 2016. Waist of ski models 2016 and 2017 is 65 mm, which is cool, but 2 mm less than that, in my view, a successful model of 2015 (and probably and earlier models). Changes in the construction or the use of more resistant to torsional stress materials is not declared so. The shape of sidecut in the model 2017 is significantly redesigned. The tip part of the cutout has become more radical, that is, with a wider shovel, but with stronger cutout of significant portion of the tip part. The situation in tail part is reversed, almost all of the ski tail is noticeably wider, but heel clipped so that parameter of tail width became less. Does that change the behavior of the ski is hard to assume, since the changes, though are noticable, but not too significant. In addition, say once again that the shape of the sidecut does not define totally the characteristics of the skis in the snow.